Holywood Alliance Councillor Larry Thompson has welcomed news from the Minister for the Environment that a formal warning letter has been sent to owners of 1 Stewart’s Place, Holywood outlining work that must be taken to safeguard the listed building. News was received from the Environment Minister in response to an Assembly Question from Alliance MLA Chris Lyttle. 1 Stewart’s Place was built in 1840 and is a listed building in the Town Centre on a street named after Holywood’s first Post Master. Concluding, Cllr Thompson remarked “Facing 1 Stewart’s Place is its sister building 3 Stewart’s Pace which was restored in 1993 by Hearth Housing Association. This restored building provides a clear example of how 1 Stewart’s Place could look if fully restored. I will continue to lobby and support Holywood Conservation Group and UAHS as they campaign for action to restore this historic building which acts as a gateway into Holywood”. To ask the Minister of the Environment how much funding was allocated for the repairs to the listed building at 1 Stewart’s Place, Holywood, and whether this funding has been accepted and spent. 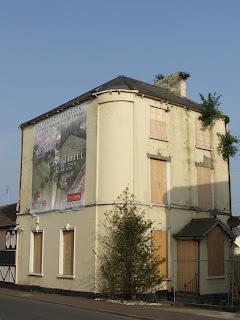 The NIEA Historic Buildings Unit (HBU) has been in contact with the owners of 1 Stewarts Place (Wilson Group) since 13 Oct 2008, when a site meeting was held to agree the scope of urgent remedial works. Subsequent to that meeting, and after the issue of a dangerous structure notice from building control - as well as a warning letter from HBU - some urgent repair works were carried out. Following this first intervention, an application for NIEA listed building grant-aid was made to carry out further urgent repairs, along with some less urgent works, to address repairs to the building. After prolonged negotiations with the Wilson group - as to the extent of the works - a letter of offer was made on 3 October 2011, for the sum of £2,010. This offer of grant-aid has been declined, and the owners have stated that - due to the difficult economic environment - they do not intend to proceed with the works agreed in the grant-aid application. On the 5 February, the Wilson Group indicated, in a telephone conversation with the NIEA Area Architect, that they would be willing to carry out the minimum works necessary to fulfil their statutory obligations, to secure the fabric of the building. An ‘Urgent Works’ warning letter will be issued to the owners by the NIEA Conservation Architect on 12 March, confirming the works which must be undertaken to safeguard this building.